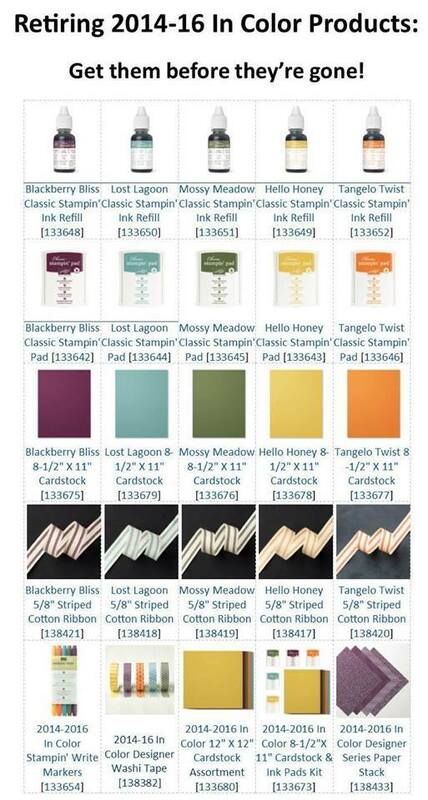 One of the many awesome features of Stampin Up products is our color coordination. Everything matches, it’s like Gar-animals. Remember those clothes when we were kids? The monkey tags went with the monkeys, making it easy to dress your kids in matching clothes. Stampin up is like the Gar-animals of paper crafts lol. The In Color collection is different from our Core Collection. Each year 5 of these colors go away, and we get 5 new colors. It’s a great way to introduce fresh and trendy colors. The In Color Collections are named by the year they were introduced and the year they will be retired. For example the collection retiring this spring is named 2014-2016 In Colors. They are retired with the Annual Catalog in the spring. This year’s catalog will be retiring May 31, 2016 (marked on the front of the catalog). You can find the Catalogs online on my blog on the right side of blog or use the Shop Now button. The date of the 2016 Retiring List will be Monday April 18, 2016. I’m giving you this head’s up so you can start budgeting your purchases and collecting the products you want with these colors before they sell out. They often sell out within days of the Retirement list being announced. I recommend stocking up on these products now, especially ink pad refills and card stock. This way, you’ll have everything you need when the list is announced and won’t have to worry about quick sell-outs.